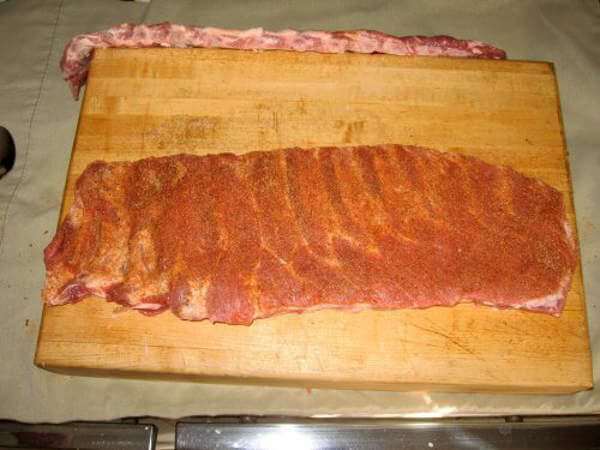 When you invest time in rib preparation, a spare rib slab is transformed into a gorgeous rack of ribs that cooks evenly and is easily sliced into one-rib sections. A trimmed slab provides the benefits of uniform texture and doneness. 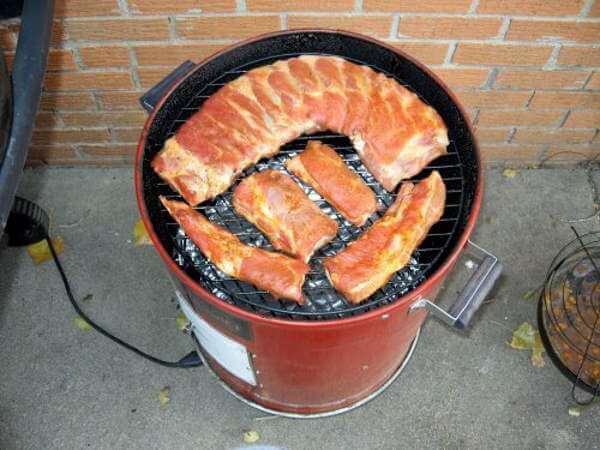 You can also fit more into your smoker, either by using a rib rack or rolling the slabs. The sparerib slab includes a hodge-podge of bone, gristle, membrane, flesh and fat attached to the meaty rib section. 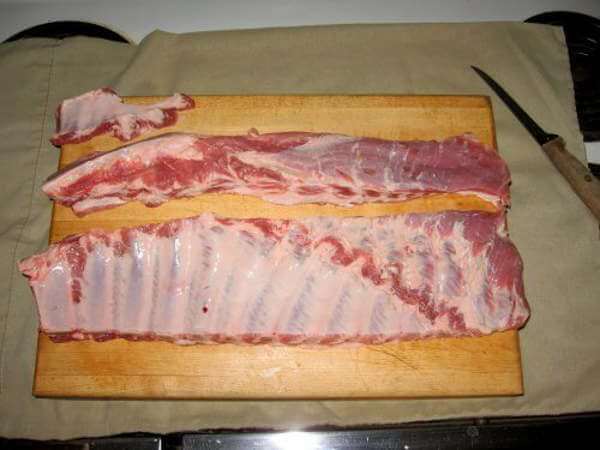 Because of variation in overall thickness whole spareribs tend to cook unevenly - when the meat next to the rib bones is done, the thicker sternum section still needs more cooking time. Rib preparation solves that problem. These are all removed, leaving a rectangular section of meaty ribs. 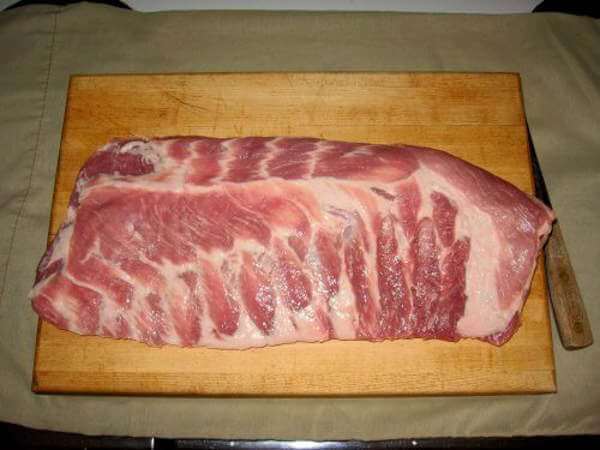 After trimming, excess fat is removed from the ribs before they are seasoned and smoked. All of the trimmings, except for the fell, contain some great tasting meat that's great for snacking or other dishes. When the pig is butchered, the diaghram is removed from the body cavity and a portion of this is left on the bony side of the slab. The amount of skirt remaining can vary. Sometimes it's pretty narrow as it is in this case, while on a different slab it could be rather large. A knife with a narrow, flexible blade is best for this chore. 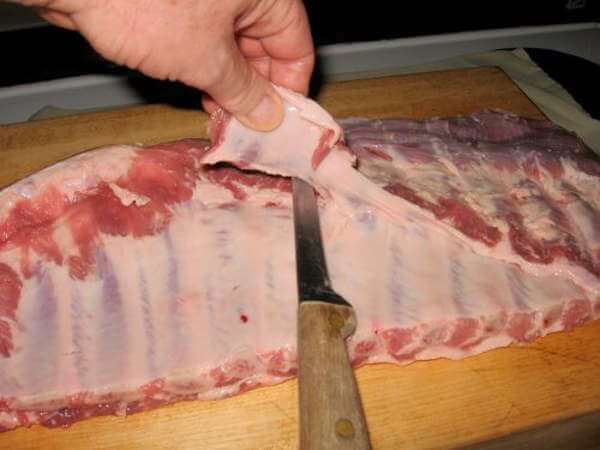 Lay the blade flat against the rib bones to remove the flap. The skirt is covered with a membrane that should be peeled off before it's cooked. A light dusting of your favorite dry rub seasoning and an hour or so in the smoker and it'll be ready to munch on. You can see the point on the right end of this seasoned untrimmed slab. It's the triangular section that lies just past the last rib bone. Remove the membrane and it's can be cooked many different ways. I like to cut it into strips, season with teriyaki sauce and thread onto skewers. These are great cooked on the grill. Next, the bony sternum is removed along with the rib tips and the point. The sternum is the thickest part of the whole sparerib slab, containing the breastbone and a bit of cartilage. The brisket contains the cartilage that extends down to the belly of the hog from the rib bones. The point is boneless and has very little if any cartilage. 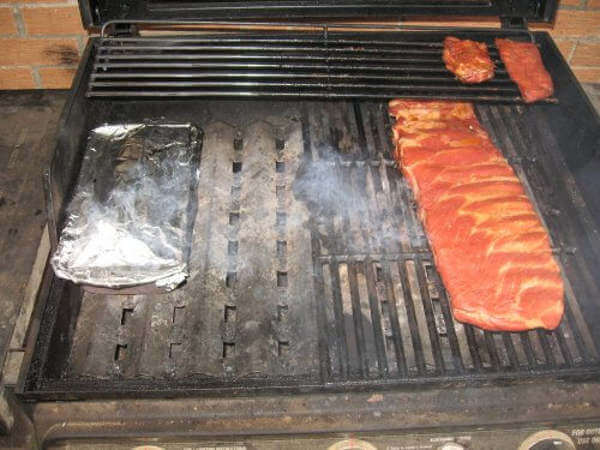 As you can see in the picture, the trimmed rack of ribs is at the bottom. The strip above that includes the sternum (the left end) with the rib tip section to the right. At the top-left corner of the cutting board is the skirt. Next the tough membrane is removed. This membrane, also known as the "fell", lines the inner surface of the rib cage. 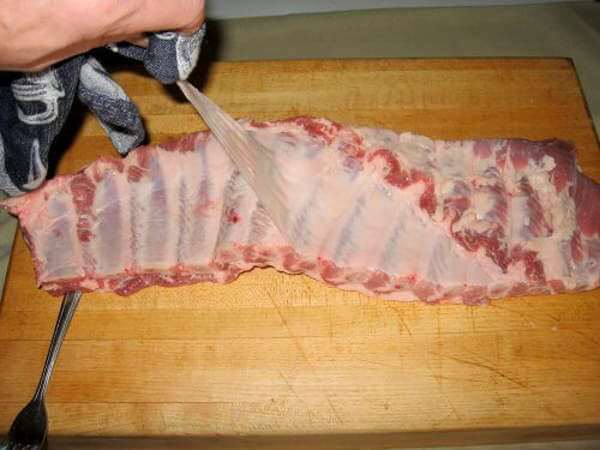 Removing the fell exposes small pockets of fat that are later scraped off, and allows flavors from dry rubs or marinades to penetrate the meat. Begin by slipping a dull instrument between the membrane and a rib bone. Use the handle end of a fork or teaspoon, or even a screwdriver. Gently pry the membrane loose then peel it off. As you can see in the picture above, the fell peels away easily. Grasping the membrane with a kitchen towel or paper towel makes the job much easier - since it's pretty darned slippery! You'll notice there are actually two membrane layers on the bony side of the ribs. The top, rubber-like layer is the only one you want to remove. Removing the fell exposes deposits of fat that can now be scraped off the slab. The best scraping tool to use is the curved tip of a teaspoon or tablespoon. 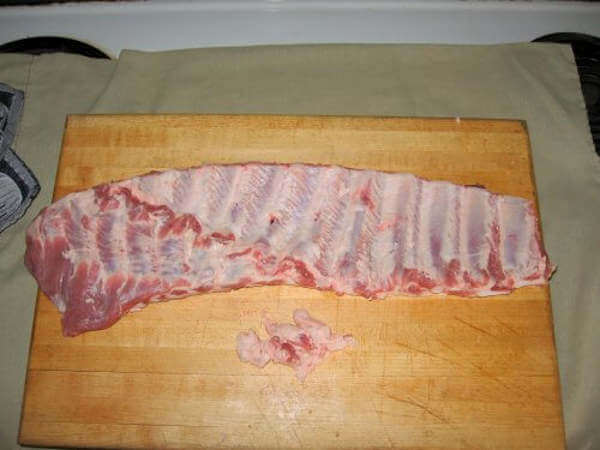 After de-fatting the bony side, inspect the other side of the slab for excess fat that can be trimmed away. 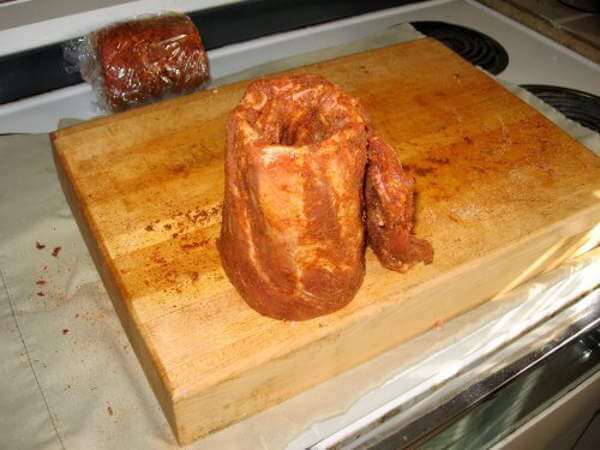 Trim off any stray scraps of meat around the edges while you're at it. If you make your own sausage, save these trimmings of fat and meat for the grinder. To add great flavor season your slabs with a dry rib rub, or if you like, you can use your favorite marinade recipe instead. Combine the ingredients and mix thoroughly. This recipe makes enough dry rub for one slab of ribs. You may have noticed that the recipe contains just a small amount of salt in relation to the other ingredients. Since most pork is injected with a preservative brine before being packaged and sold, it doesn't need a lot of additional salt. Sprinkle on the rub mixture, then rub it in well. The easiest way I've found to apply the dry rub mixture is to use your trusty teaspoon. 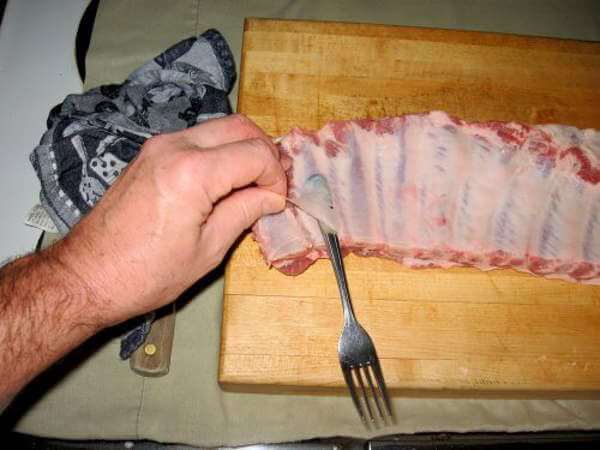 Just fill the spoon, hold it over the ribs, and tap the handle with your index finger to create a shower of flavor. Keep in mind that the bony side will absorb less the dry rub than the meaty side. 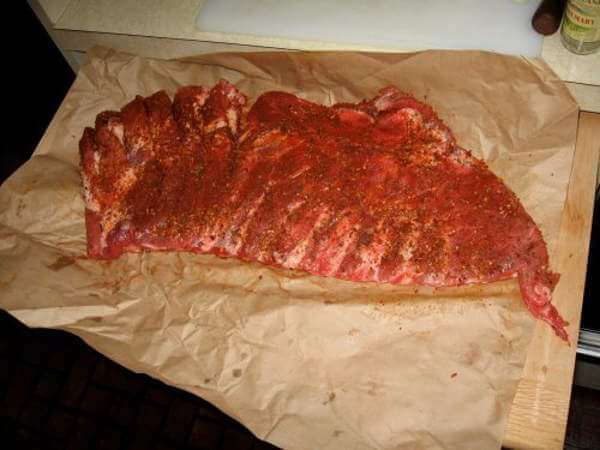 After seasoning, roll the ribs and wrap them in plastic wrap to rest for a couple of hours. The dry rub flavors will absorb into the meat during this rest period. 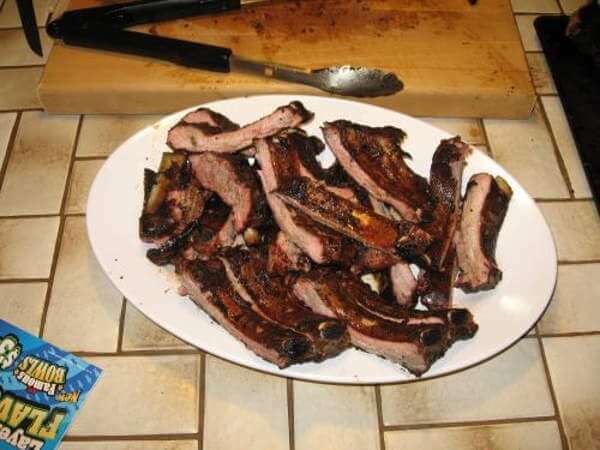 There are lots of different types of meat smokers that can do a fine job of smoking spareribs, as are there many types of smoking woods you can try for a unique flavor. This slab found a temporary home in my vertical electric water smoker. I used chunks of mulberry wood for the smoke (which we have a lot of growing around here in South Central Kansas). Mulberry gives the ribs a light, fruity taste. I smoked the other slab using the gas grill smoking method. Hickory chunks provided the smoke here. I used an old bread pan covered with foil as my smoker box in my gas grill. 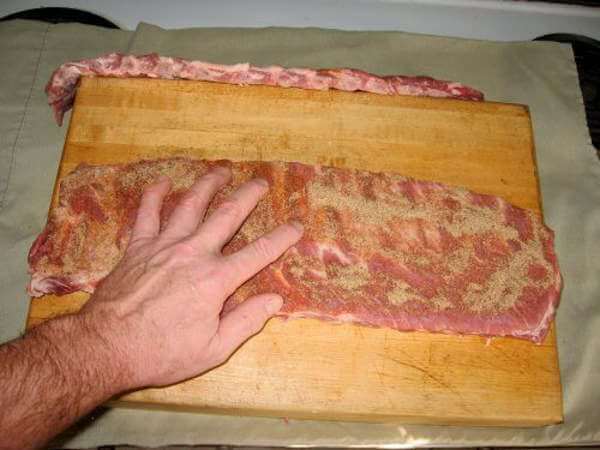 When the ribs are done, allow them to rest before being cut into individual sections and served. 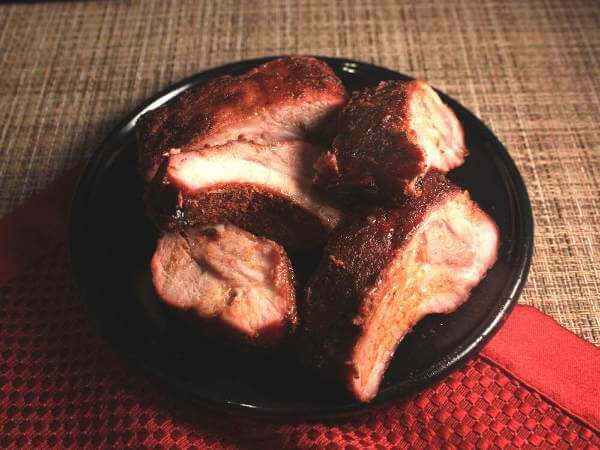 A couple of nice smoked side dishes would be a great accompaniment to your tasty pork ribs. It's important to allow the smoked ribs time to rest after cooking. Immediately after taking them out, wrap them with foil and place them on the kitchen counter for 20 to 30 minutes, covered with a dry towel. During this rest period the juices will redistribute through the meat, helping them remain moist. Without a rest, the juice will run out when the slabs are cut. A batch of homemade barbecue sauce would be the crowning touch to your perfectly smoked slabs of perfectly prepared spareribs.